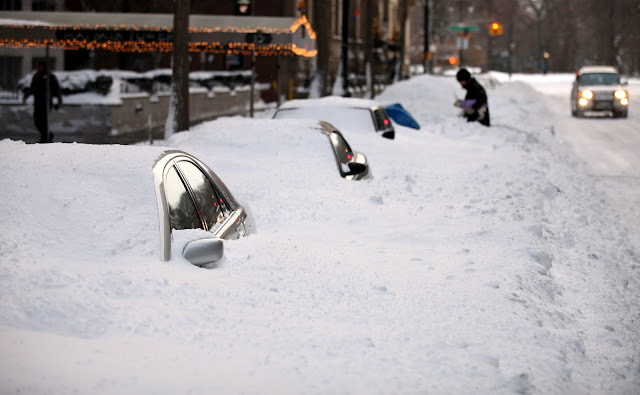 The Big Wobble: WINTER REVENGE: BLIZZARD WATCH, DC, NYC, BOSTON: Biggest and most impactful storm of the winter (record breaker) set to blast the North East! A major nor'easter threatens to shut down travel due to heavy snow and strong winds from Washington, D.C., to New York City and Boston early this week. The snowstorm will first continue to bring snow and travel problems in the Midwest through Monday. A storm will rapidly strengthen and track within a couple of hundred miles of the east coast of the U.S. spanning Monday night to Tuesday night. For many areas in the Northeast, this will likely be the biggest and most impactful storm of the winter, according to accu weather. Last night, St. John's International Airport, Newfoundland and Labrador stated the airport facilities received significant damage during the windstorm that affected the region during the last few days. An electrical component in the airport's terminal electrical room was damaged. The potential historic storm should land on the north east coast Tuesday through to Wednesday and promises to be a record breaker. The storm will batter New England and the north east with heavy blizzards and powerful winds. More than a foot of snow can be expected with damaging and prolonged north east winds and serious east coast flooding. For thousands of miles of roads in the region, this will be an unusually cold storm for the middle of March. Much of the snow that falls will accumulate on the roads. In Charlotte, North Carolina highs were in the 60s F and 70s F last week, but a dramatic temperature drop covered parts of the southern United States in snow. "Highs for this upcoming Wednesday and Thursday temperatures may not get out of the 40s with lows in the 20s when the peak of the arctic air will hit. Average highs during mid-March are in the mid-60s with lows near 40 F," Brett Rathbun AccuWeather Meteorologist said. Based on that information, temperatures will be nearly 20 degrees below normal. It is not unusual for this arctic air to get as far south as the southern United States in March. "Temperatures have dipped into the teens and 20s but many of these record-low temperatures were set in the late-1800s and 1900s," Rathbun said.